WASHINGTON – Congressional Leadership Fund (@CLFSuperPAC), the super PAC endorsed by House Republican leadership, launched two digital ad campaigns today targeting Representatives Antonio Delgado (NY-19) and Colin Allred (TX-32). The ads target both members on their costly environmentalist agenda and the Green New Deal put forward by Rep. Alexandria Ocasio-Cortez. On the campaign trail this year, Delgado called for the Green New Deal, while Allred volunteered to voters his support for a carbon tax. The ads will reach swing voters in their respective districts and will run on key digital mediums. “Alexandria Ocasio-Cortez is the new leader of the Democratic Party and Colin Allred and Antonio Delgado are already falling in line with her radical agenda. The so-called Green New Deal is nothing more than a far-left wishlist that will result in higher taxes and less freedom for Americans,” said Zach Hunter, Congressional Leadership Fund Vice President. VO: Less freedom, higher taxes. Antonio Delgado and Alexandria Ocasio-Cortez have begun their radical Green New Deal assault on the American economy. 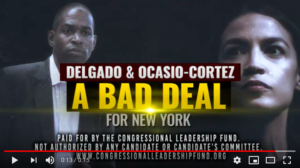 Delgado and AOC: a bad deal for New York. 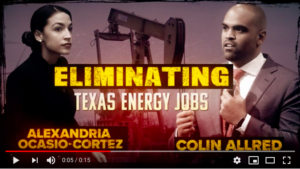 VO: Colin Allred and Alexandria Ocasio-Cortez are hard at work eliminating Texas energy jobs. His carbon tax and her Green New Deal means skyrocketing prices, higher taxes for Texas families.